My children and I have a sensitivity to gluten. How do I know this? Well, I guess I don’t know for sure yet. There is a blood test but we haven’t taken it. We will know for sure by the way we feel once we eat it again. Some of our symptoms include gastrointestinal issues, allergies, irritability, and skin issues. We have made a commitment to eating gluten-free for the month of December. Really it was two days after Thanksgiving until Christmas. Each of us has chosen to do this. No one is being forced. It has been two and a half weeks and we are doing really well. Not only are some symptoms subsiding but we have enjoyed the challenge of finding nutritious foods without wheat, barley or rye ingredients. I have been surprised over and over again to find how pervasive gluten is in our food supply. The best way to avoid it is to eat whole foods (the way they are presented in nature). It seems that as soon as we start processing products, we need to find things to fill and bind. Apparently, gluten is good for that. This adventure has already brought more gifts than challenges. With a shared goal, we are a unified group. As with many families raising teens, it can be hard to find common ground. We have been looking for meal solutions together and the kids are even making some stuff ahead of time to bring for their lunch and activities. Another cool result of being gluten-free is that we are all reading food labels. Both children are noticing other odd ingredients in standard American diet foods and commenting on it. I know it doesn’t sound like a big deal but it really is. We have a nutritional epidemic happening in our country because adults have no idea what they are eating or what they are feeding their children. I am super proud of my kids for choosing to be aware and make the necessary changes. I am not saying that it has been easy. There is plenty that we miss but I most definitely am enjoying the experience. Balancing tip – Just because something says it is gluten-free does NOT mean it is healthy. If you are on a gluten-free diet or considering trying it, please continue to read the description beyond the gluten-free labeling. Use good judgement and know that it is always the best option to eat food exactly as Mother Nature intended. *Following up from my announcement a couple of weeks ago, I have launched a web boutique called Red Earth Warrior. I don’t have everything loaded into the site yet but you are welcome to take a look around. I would love to hear any feedback you might have. In addition to the essential oil blends and clothing that is there, I am offering Salt Lamps, Salt Inhalers, Fair Trade Thai Silk Scarves, and more. Please feel free to share the link with your friends! Posted in life, nutrition, parenting, Uncategorized, wellness and tagged Allergy, Christmas, Coeliac disease, diet foods, Food, Gluten, Gluten Free, Gluten-free diet, Health, Mother Nature, reading food labels, Special Diets, wheat barley. Bookmark the permalink. So I took the summer off from blogging. I decided to focus any extra time I had on my family. It has been a great summer. We took a couple of vacations as well as enjoyed the beauty Sarasota has to offer. I continued to work and even had the opportunity to teach some yoga on the road. School starts on Monday and I think we are all feeling restored as individuals and as a family. During this time, I’ve made some new connections and strengthened existing friendships. Reflecting on the past couple months, I would have to say that this time has been about relationships with others. There has even been a shift in my relationship with my husband. I feel we have grown as a couple because of our willingness to look at each other with appreciation, to give each other the benefit of the doubt, and to look for ways to find solutions instead of proving a point. After seeing the impact yoga has made on my life, spiritually, emotionally and physically, my husband is getting ready to start a yoga teacher training program. I am super excited for him! He really has no idea what he is getting himself into, but I think he will love it if he lets himself fully experience even half of what this program has to offer. I feel like this will expand our relationship even further. I look forward to sharing ideas with him about the deeper meaning of the Sutras, about the physical practice and about how the study of this practice can impact our family. I am content in knowing it will all unfold just as it should. Posted in life, nutrition, parenting, wellness, yoga and tagged family, life, relationships, summer, vacation, Yoga, yoga teacher training. Bookmark the permalink. I spend a lot of my time on the bleachers. There are days that I don’t want to be anywhere else and there are days when I struggle to not pull out some work. It seems to be the one time when I’m not working, that I can do just one thing–watch baseball. I watch my son play baseball. He is in the local Little League. His team consists of 10, 11 and 12 year-olds. There are tons of benefits to his participation: exercise, teamwork, social skills, perseverance, etc. I think it’s great that he has this opportunity. Some of the kids on the team are pretty good and some not so good. My son probably falls somewhere in the middle. The kids are great and so are the coaches. What I find to be the most interesting is the other parents. Not all of the other parents. About half of them are pretty chill. During a practice, they might read a book or chat quietly with each other. During the games, they are cheering the kids on and enjoying themselves. It’s the other ones I’m referring to. The ones that scream at their kids to make better plays or allow veins to bulge in their neck and forehead because a 10 year-old child swung at a ball that was at eye level. I just don’t get it. These are children who are “playing”. Although I don’t get caught up in professional sports, I remember my father yelling at the TV during sporting events. My rational in being ok with the latter is that these are adults making serious money. They are paid handsomely to only swing at strikes. And even then, they make an out more than half of the times they are up to bat. What would make anyone think that a child could do better than that? At last night’s game, we were getting creamed by a team we had beaten the week prior. This was exceptionally hard on “those” parents. As I watched, I started to make a connection between these people and the people we know who make a lot of noise on the perimeter of our lives. You know, the ones who critique and voice displeasure even though it has nothing to do with them. They should be mixing it up in their own game, but instead stand on the sidelines and mock. I came to the conclusion that it was good practice for the kids for later in life. After the game, I asked my son if the comments bothered him. His response was, “What comments?” I hope he is still saying that 30 years from now. 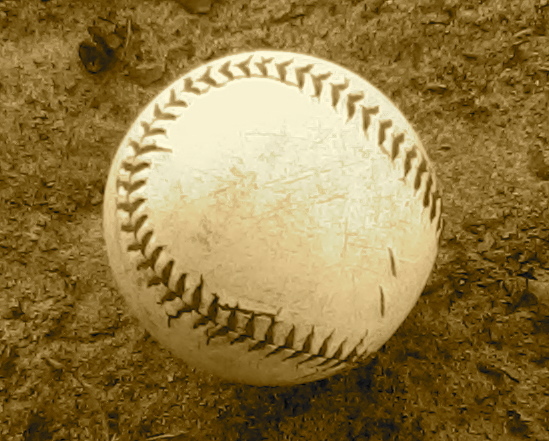 Posted in life, parenting, Uncategorized, wellness and tagged family, life, Little League Baseball, parenting, wellness. Bookmark the permalink. I had the day off. I realized at some point that it was opening day of the Sarasota County Fair. It seemed like the perfect thing to do. I could get away from my half-finished to-do list and the kids would be entertained. When we arrived, Bella met up with some friends so Little Roger and I started to explore. I used to love going on rides, but they haven’t been agreeing with me for the past couple of years. 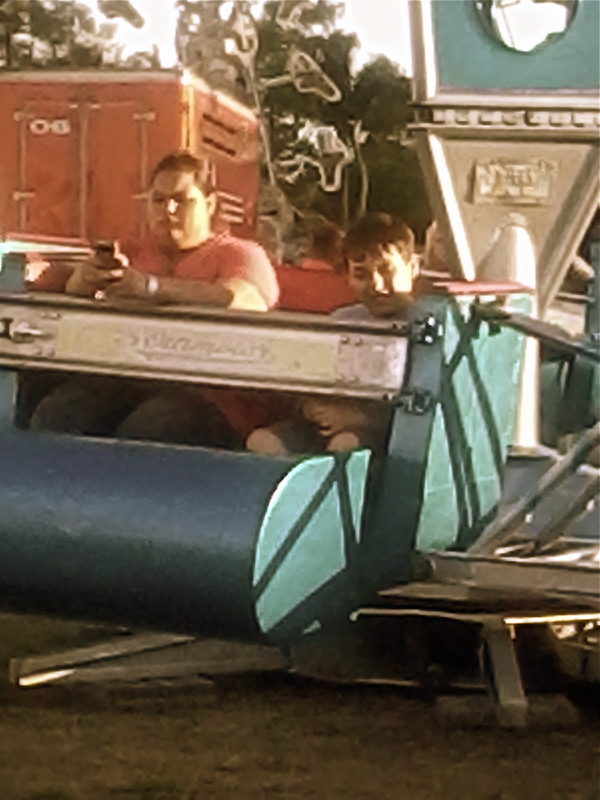 My eleven-year-old was a little bummed that he didn’t have a companion for the amusement rides. Trying to be nice, I went on the ferris wheel. That was pretty much my limit. When we came to The Scrambler, I knew there was no way we would be able to stay at the fair if I went on it with him. He said he would go by himself. He got in line. The girl in front of him turned around and asked, “Do you want to ride?” He nodded. I wasn’t sure what was happening and I don’t think he was either. The ride operator opened the gate for them and Roger followed the girl to a car. She motioned for him to go in first. As he was climbing in, I wondered if I should stop him and tell him to get on one by himself, but I let it go. I was mesmerized by the situation. She climbed in after him and they buckled themselves up. I don’t think there was any conversation between them other than the initial question from the girl. As they were waiting for the ride to start, Roger made faces at me as if he was also in disbelief about where he was sitting and who he was sitting with. I couldn’t stop laughing. I acted like I was texting on my phone when I took the picture shown here. Just looking at it makes me laugh. Once the ride started, they both laughed. As it went faster and he started to slide into her, I could tell he was feeling uneasy. I really felt for him, but it was really funny! “You don’t need to do that, and how was he helpful?” I replied. This child never ceases to amaze me with his compassion and generosity. He went on a couple more rides and we ate some crappy food. It was great! There were farm animals, motorcycle stunt shows and plenty of games. We spent hours just wandering around. No agenda, no time frame. We were lost in the moment and in that moment I felt wonderful. When Bella had enough of her friends, we reunited and slowly made our way through the fair exhibits and back to the car. I feel very lucky that despite the fact that I often have no idea what I am doing as a parent, my kids seem to be doing well. They are growing up to be more than I could have ever hoped. Days like today help me to see that there is a balance point and that every once in a while, I hit it. Posted in life, nutrition, parenting, recipes, Uncategorized and tagged balance, green smoothies, life, nutrition, parenting, sarasota county fair. Bookmark the permalink.